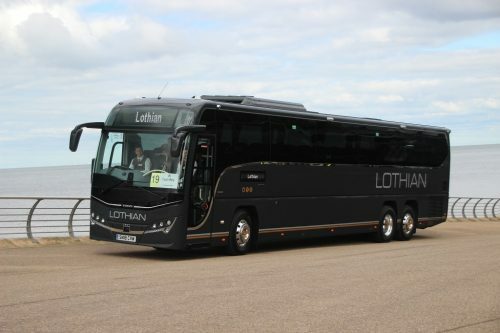 The ‘big reveal’ at the UK Coach Rally was Lothian Motor Coaches, the new coach brand for Edinburgh-based Lothian Buses. Two of the five ordered Plaxton Panther 3-bodied Volvo B11RTs were present at the event, with one competing in the rally and another attracting a lot of interest on the ADL stand in the trade area. The smart specification of the 14m long tri-axle 61-seaters includes a floor-mounted toilet. An interesting feature of the vehicles is the new step arrangement, with four instead of three to the level of the driver’s cab area and two as opposed to the traditional one into the saloon.